Marvin’s Room by Scott McPherson is a play made of pure American naturalism with a dash of black humor, in the tradition of Steel Magnolias (and it is no coincidence that both are possibly at least as well-known as films). Family obligations and caring for the sick are timeless themes and they are treated here with both warmth and truth. Despite a few instances where the profundity of the moment seems a little too obviously signaled, as a whole the play demonstrates a skillful subtlety, ably-matched by Anne Kauffman’s similarly light-handed direction. However, in the space between the original production and today the play has lost some of its emotional punch. Set in Florida in the early ‘90s. 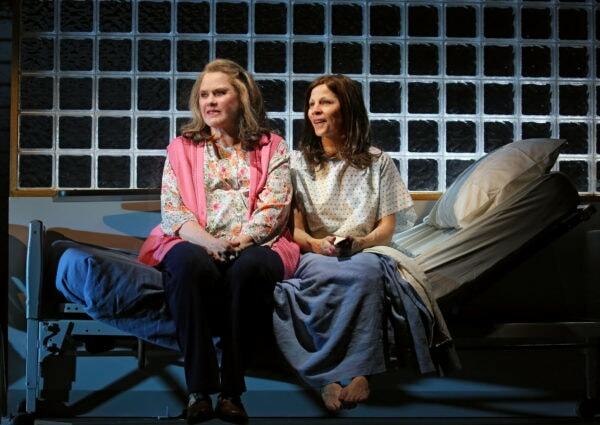 Bessie (Lili Taylor) takes care of her ailing father, Marvin, who “has been dying for the past twenty years,”—and who is never seen, but whose muffled voice and shadowy figure behind a wall of frosted glass blocks serve as a consistent reminder of his presence—as well as her good-hearted but slightly batty aunt Ruth (Celia Watson), who suffered from three collapsed vertebrae in her back, until her “cure”: tiny electrodes medically inserted in her brain, with a dial that will miraculously relieve the pain, but may also cause the garage door to open if she uses it in the kitchen. The crisis comes when Bessie is diagnosed with leukemia—the same disease that killed her mother—and she must call on her estranged sister Lee (Janeane Garofalo) and Lee’s two sons, Hank (Jack DiFalco) and Charlie (Luca Padovan), in the hopes that one of them may be a match for a bone marrow transplant. Lee has her own issues, not least of all the teenage Hank who is currently institutionalized after burning their house down. It is one of the great pleasures of this production to see three experienced actresses, known for their ability to embody complex and interesting characters work together on stage. Regardless of the Marvin of the title, this play from the 1990’s passes the Bechdel test. It is frankly more refreshing than it should be in 2017 to see a work centered around three different women, whose character breakdowns would not necessarily refer to the men in their lives. The undeniably talented Taylor, Garofalo, and Weston are, however, well matched by each member of the supporting cast. The humor, particularly in the scenes with the brilliantly bumbling, and aptly named, Dr. Wally, (Triney Sandoval) nudges the farcical while never losing the serious human drama at its core. The considerable exposition required is drawn out gradually through dialogue that retains its conversational ease. McPherson even manages the remarkable feat of having a teenager and young boy actually sound their age. The evocative and flexible set by Laura Jellinek shifts almost seamlessly from one scene to the next. These transitions are assisted by Daniel Kluger’s dreamy sound design and Japhy Weideman’s lights (although, I did wonder why the tradition of pretending stagehands dressed in black are somehow invisible still persists). Jellinek’s ingenious use of rotating sections of wall within a broader frame of what seems to be a sort of white stone trellis, on which palm trees in discreet yet tropical shades are either printed or projected, captures the era and the Miami setting, while also almost literalizing the way medical institutions (the doctor’s office, the hospital, the “loony bin”) meld into the domestic space of the home and vice versa for these characters in a way that beautifully speaks to the profound human experience at the heart of the play. Despite these strong elements, I wonder why resurrect this play now? Artistic Director, Todd Haimes’s program note makes a claim for relevance, but provides no particular reason for its revival other than bringing an overlooked play from the past to newly appreciative audiences. McPherson, according to his playwright’s note, was inspired to write the play by his “cancer-ridden” grandmother to whom his mother devoted her life “with terrifying determination,” possibly afraid that if she didn’t “she would awaken to find herself running off in the other direction.” In the play Bessie essentially embodies the devotion and Lee the fear. But the fact that Lee’s fear is a realistically human and completely understandable response is rather overshadowed by the saintly, indeed martyr-ly, Bessie. In addition, Marvin’s Room was inspired by AIDS and the isolated community of carers and sufferers it generated. McPherson’s partner had AIDS at the time McPherson was writing this play, as did many of his friends. He himself would eventually succumb to the disease. McPherson’s remark in his playwright’s note, brought to life in Marvin’s Room, that “as dying becomes a way of life, the meaning of the word blurs” would clearly have had a much sharper resonance in the 1990’s than it can quite capture today. The play delves into the very real struggle between looking out for oneself and the reciprocal gift bestowed through caring and compassion. In a clumsier production, such a moral might be overwhelmed by sentimentality, but here the saccharine is skilfully cut through with comedic bite and nuanced performance. Despite the compelling human stories at its core, and the potential for broader significance, ultimately Marvin’s Room never quite hits you where it should. Even the most poignant elements do not provoke an especially strong response and there are few surprises. With that being said, a well-written play, with damn-fine actors, and a strong production team may indeed be reason enough to bring Marvin’s Room to Broadway in 2017 (this is its Broadway début). If what you are looking for is simply an enjoyable few hours at the theatre, this production offers that. If you want your foundations shaken, look elsewhere.